My IKEA wardrobe held my television, speakers, and other electronic paraphernalia for a while. I loved the tidy look of having everything tucked away behind doors. However, in practice, the doors were rarely closed because I am almost always listening to music. 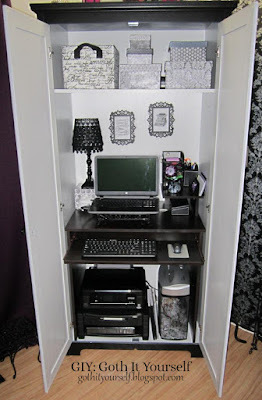 I decided that the wardrobe might serve better as an office armoire. As it turns out, an IKEA wardrobe makes a great office because it's deep enough to hold an actual desk. Putting the desk inside the wardrobe makes it sit a few inches higher, a wonderful bonus for me as normal desks are always too low for my tall self. My printer and shredder fit neatly under the desk, while the slide-out tray makes using the keyboard and mouse easy. On the desk is a decoupaged tissue box raising a lamp with lace-bedecked shade to proper height. The top shelf holds decoupaged boxes. 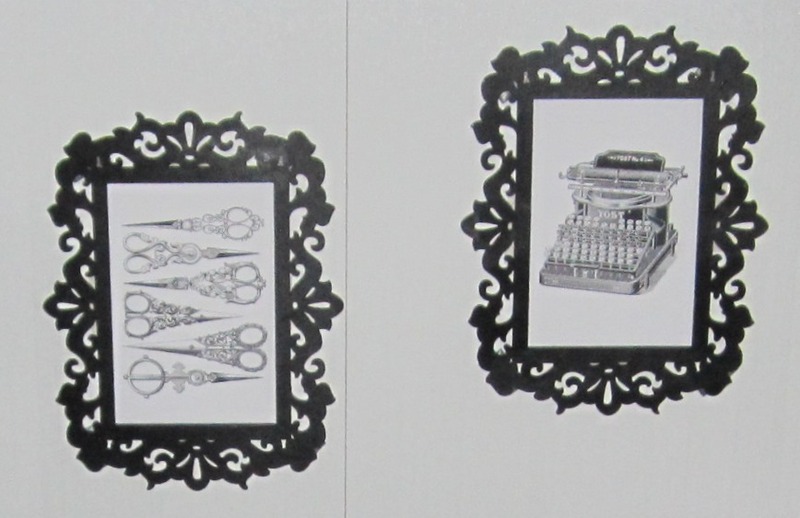 Drawings of a vintage typewriter and vintage scissors serve as artwork. I'm so pleased with the result! I can work very comfortably at the desk. When I'm done working, I can simply push in the keyboard tray and close the doors. 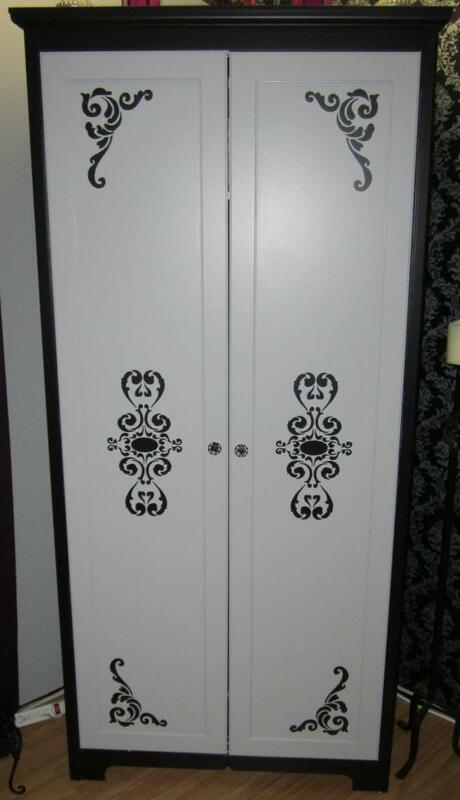 The wardrobe looks nice in the corner of my living room. Aw, thank you! Because the keyboard tray slides out, I sit a little distance back from the floor of the wardrobe, and there's room for my feet. There is some limitation to foot movement, mainly because of the printer and shredder. I couldn't stretch my legs out in front of me, for example, but I typically don't do that anyway. If I did, I'd probably move the printer to the top shelf to make room. I love your concept of an office in a wardrobe it sounds like an excellent idea. The concept would work well for small accommodation and should market it. Thank you! I was pleased to be able to fit so much stuff in a small space. I love how you decorated it! And it is crazy to think you can put the whole desk away in it! Mind blown! I cannot wait to have my own home and go back through your blog for tips n tricks! What a cool idea! 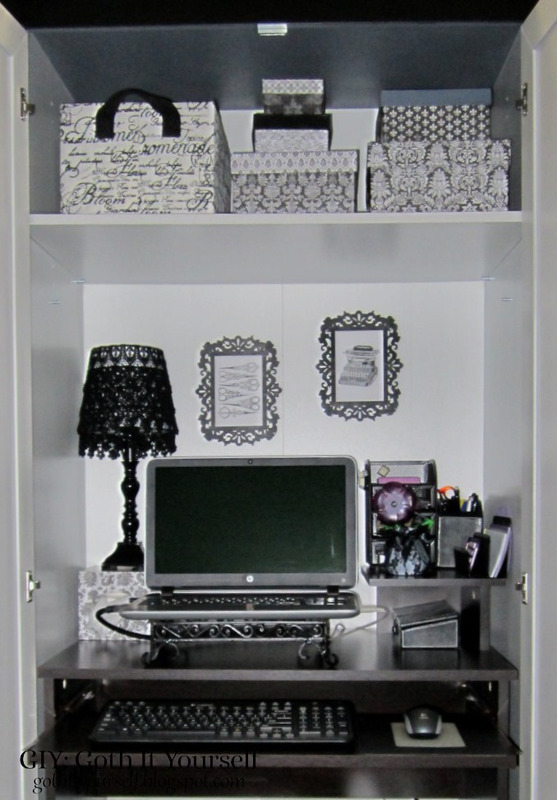 I always liked a hidden desk and was looking at the cabinet desk with upper bookshelves that IKEA already has. This is amazing!!!! This is my dream! I have always liked desks that close and hide away my papers. I never even considered that I would be able to hide my printer as well. Very cool! Thanks! I always thought the printer and shredder were such an eyesore. I love that they're now hidden but still easily accessible. Awesome! 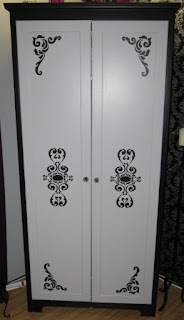 This is perfect and it looks so great - the clear black and white contrast with those beautiful patterns. And the purple flower is a lovely highlight. Thank you so much! I am very fond of black and white patterns. 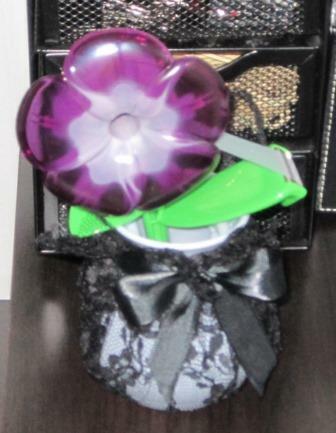 :) And the purple flower tape dispenser was too fun to pass up. Fantastic idea for a small office. And I especially like the stencilling you did to make it your own. You are very talented! I'm sure all these compliments are getting old to you (heheheh, right! ), but I have to add mine for the record. This is AMAZING! You are an incredibly talented interior designer, and IMHO, you should be in business!! Thank you so much! My confidence tends to run low, so a little reassurance never hurts. :) I would love to work as a professional organizer if it didn't require marketing myself and networking. This is such a good idea and I may have to do the same for my craft desk so that I can keep ongoing projects out and still keep them away from the baby and the dog. Thank you for this solution, I would never have thought of it! OMG!!!! THIS IS GENIUS!!!! I LOVE IT!!! !